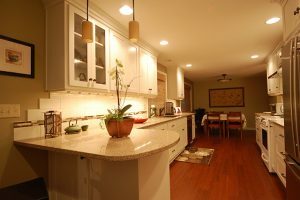 With the different types of purpose kitchen lighting, one can be confused by what type of light goes where. There are two main types of lights–task and ambiance. Finding out which of these you will need is important. If you are going with task lighting than you most likely will be installing under-cabinet lights for food preparation or sink lighting for washing dishes. The second type of kitchen lighting is ambience, this is typically used as recessed, above cabinet and/or pendant lighting. You could also use in-cabinet lighting as a type of ambiance lighting, this style of lighting illuminates the inside of the cabinetry. Do your homework when it comes to selecting your different types of lighting, and research each manufacturer, as well as educating yourself in what they can offer. Under-cabinet lighting is added to kitchen cabinetry. Typically in the kitchen the underside of the wall cabinetry can be a dark-shadowed area that makes working difficult. Under-cabinet lighting will reduce these shadows by illuminating the backsplash, which can help showcase your beautiful tile or stone and layer your lighting. The layering of lighting is a method of using all available lights in the kitchen and simply dimming them to create a layering effect for mood or ambiance. The best lighting fixtures can be purchased at your local lighting design centers. It is recommended that you hire a licensed electrician to install the lighting in your home. The lighting availability from these suppliers may use one of five types of lamps: LED, incandescent, Zenon, Halogen or fluorescent. These types of lamps influence the performance of the lighting fixture; including the amount of light, the lamp’s color, the life of the lamp or fixture, and the lamp’s energy usage. Don’t know which lamp is best for you? give us a call. Incandescent lamps are the most common types of lighting in kitchens. These lamps come in a variety of selections for under-cabinet lighting; bi-pin, festoon, and wedge. These selections are available in many different wattages and correlated color temperatures (CCT). CCT refers to the color of the light, (for example, a warm golden tone vs. a clean white tone). Halogen and xenon, are the two most popular because they have a higher CCT. Keep in mind these lamps are a cleaner looking white or less golden in appearance. Incandescent lamps are readily available, inexpensive, and easy to replace when one burns out. However, these types of lights have the shortest life spans and the highest energy use of the three types of lamp available. Xenon lamps tend to have the longest life span and can cost about 60 cents more per bulb, depending on the manufacturer. LEDs have quickly become popular for a variety of task lighting uses because of their low energy use. These types of lights are the brightest, have the longest life span, but can cost up to three times more the incandescent lighting. Unlike incandescent and fluorescent lamps, LED lamps typically do not burn out, these lights usually have a 50,000 lamp hour rating. White LEDs can be a bluish-white in color appearance than incandescent lamps, though a warm-white LED that looks like the incandescent are becoming more common. White LEDs are generally available in the same color range as fluorescent lamps and can even be purchased in different colors such as; blue, red, orange, yellow and green. When selecting the lighting for your kitchen remodel, the best thing to consider is if it will fit into your existing cabinetry configuration? Under-cabinet fluorescent lights are available with linear fluorescent lamps and compact fluorescent lamps (CFLs). 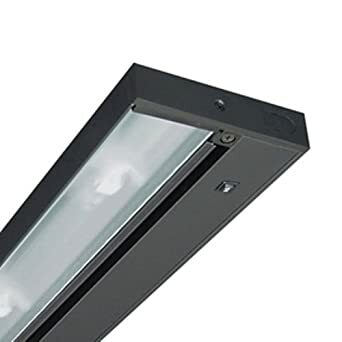 Linear fluorescent lamps are the most popular type of fluorescent lighting for under-cabinet fixtures because they have a low profile and can allow the installer to conceal them behind the cabinet light rails (trim). Fluorescent light fixtures can be linked together to create one long strain of lights, or be broken into numerous single light fixtures. Newer fluorescent lamps have many improvements over older designs, including choice of light color (from warm to cool), good color rendering, these lighting fixtures run cooler and quieter than the older fixtures. 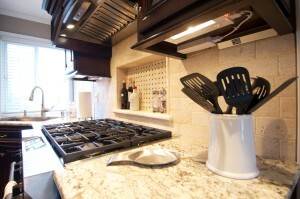 In conclusion I hope this article helps you as you go to make selections in your kitchen remodel. If you have any further questions please fell free to contact us at any time.